About a month ago I got the word that I was not chosen to receive a state arts fellowship. I decided to take them up on the offer of seeing the comments from the jurying panel regarding my entries. The last time that they actually held the competition (at least twice they have collected the applications and then decided that they didn't have the money to do the program) I had requested the juror comments but they claimed they couldn't find them. There's a long history of weird things going down with this competition. This time they did find the comments for my entry. Back in the 90's they used to give you the specific scores from each juror, and sometimes even where that ranked you in your category. Some suspicious actions and procedures were hinted at by these numbers, so maybe that's why they don't let us see them anymore. Anyway, this year's comments were generally positive. Includes things like "beautiful compact narratives in single or duplex frame", "clever imagery, clean look". One person specified, "appreciate the complexity of #8 [History of Art]", while another stated, "[21st Century] Employee piece is weak and overworked." I don't know how far this put me away from the six who got fellowships, just that I got shut out once again. See you again in a few years. 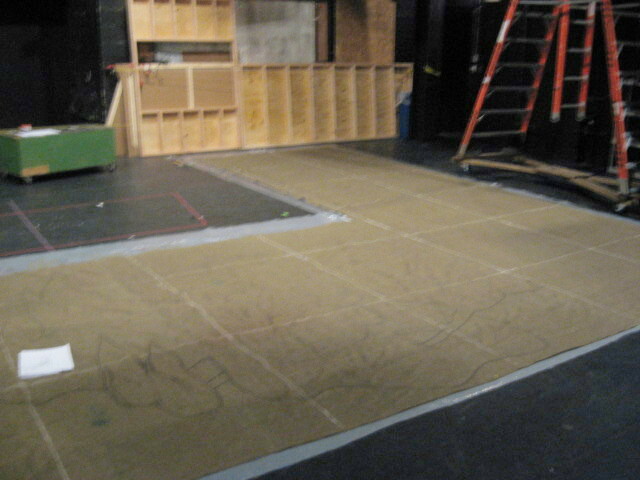 For the third consecutive day I drove down to Manasquan to lend my mural talents to a stage production. 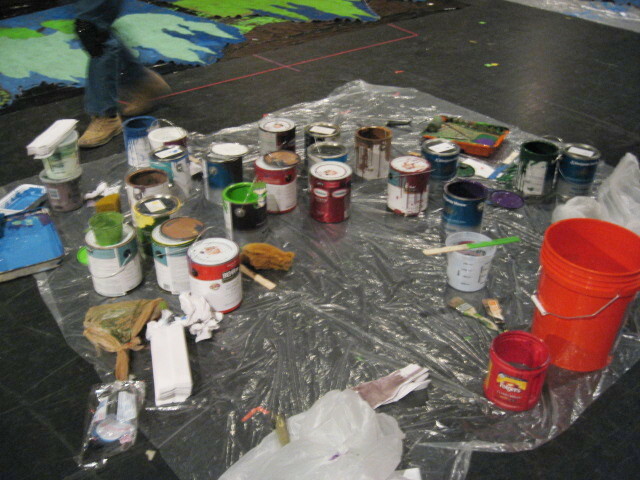 When we get rolling we get all the paint cans out. Had a lot of different things to work on today, which meant mixing a lot of custom colors. Today was going to be a short day, only 4 hours including clean up time, but we got done what we planned to do. 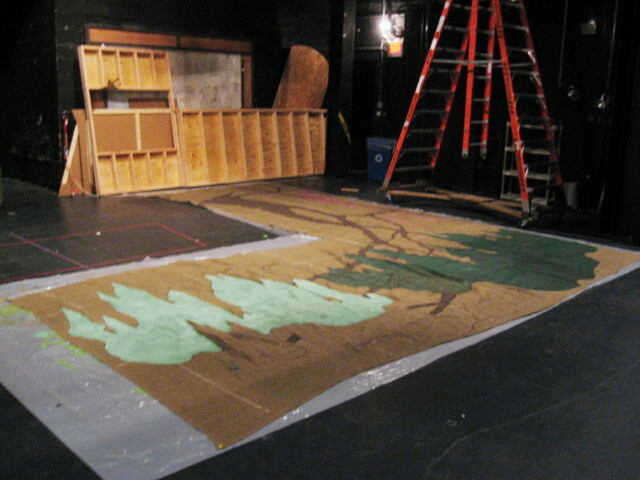 We had made good progress in the first two days on this piece of the forest, and today's goal was to get a layer of paint on every square inch of burlap. 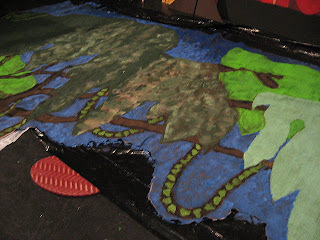 My task list included filling in a background dark color (a mix of brown and black) on all the vines, then dotting them with warm green mix to match the way vines had been painted on the other half. After that I spent a bit of time adding some texture to some previously painted leaves (the bright green area above) and filling in a medium blue into some of the remaining negative spaces above and below. 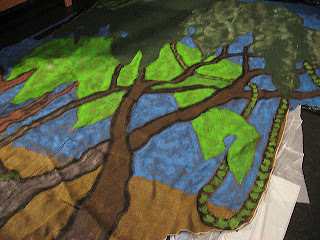 Pat also did blue and texture on this piece of the forest, while Ralph did some similar things on the other half, and made a color change to the big brown tree on this half. My last remaining minutes were spent adding more blues and purple in the negative spaces, letting them intermingle to create a gradually mixing pointillist effect, or at least we hope it will look that way from the seats. The photo below shows where we ended the day. We're all taking off for the next several days for the holiday weekend. 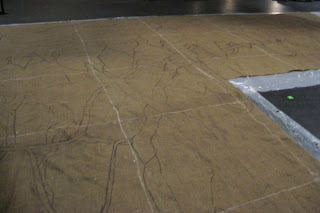 Our guess is that we can finish what remains in one more day's work, just layering more paint on what we have, which goes much faster than painting raw burlap. A quick update on the progress of my teams before the second weekend of basketball begins. The first weekend was not kind to my art teams. Villanova lost their first game. Illinois and (surprisingly) Harvard both won their first games, but then lost their second games. Only Syracuse made it through two games and will play later tonight. My other team of interest, VCU, lost in the second round, no doubt messing up many brackets, including mine. There are teams still alive that I will root for, but I only have one art team left. There are no easy games for anyone at this point, but Syracuse has decent shot of winning a few more. I'll keep track of it from here. 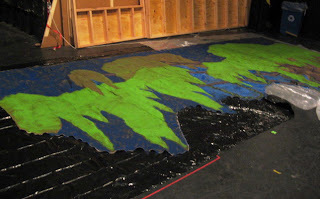 I was back at the Algonquin today to continue work on the Spamalot set. 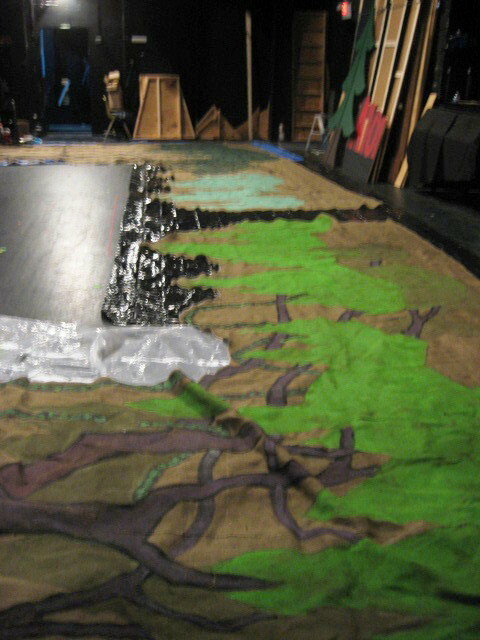 This time both halves of the scary forest were laid out in their relative positions. The large L shaped burlap pieces had been trimmed closer to the edges of the drawn elements on each half and hemmed so they won't unravel. Just two of us on stage today. Pat worked mostly on the right side piece (above, started the day before yesterday), filling in blues and violets in all the negative space around the tree parts. As with the trunks, leaves, and moss areas, this was just a first layer that will be overlaid with additional colors. Meanwhile, I was working on the left side piece, the one we had started on yesterday. With both pieces out together we could see differences between the two drawings, which were supposed to be more or less symmetrical. So my first job was to make adjustments to the tree trunks I had drawn yesterday. Since this is all just underpainting, the colors didn't have to match perfectly- it was just to make the figure-like structures more robust. Then I got some black paint and the smallest brush we had and added contour lines to all the trunks and limbs, to make the relative positions and major movements a little clearer. After my pizza break, I opened up a new can of green (kind of a cadmium green, the intense yellow-green seen above) and filled in the last two sections of greenery in the trees, while Pat added in more blue and purple sections. Once again we shut down our efforts by 4 pm, but we'll be back there tomorrow to continue the process. A few weeks ago I was asked by Pat Hutchinson of the Belmar Arts Council to help out with a project that I had shown aptitude for previously. She took on the responsibility for decorating much of the stage sets for an upcoming production of Spamalot at the Algonquin Arts Theater in Manasquan. She particularly targeted known BAC muralists, but she could use help from anyone with daytime hours and painting experience. As it happens I'm on spring break at one of my schools, giving me a little extra time for painting this week. I do have some stage set experience, but more construction. For several years my brother was involved with school plays where he works, in charge of the stage. I was tapped several times for my expertise in building things, such as stretching canvas over large frames for backdrops, or designing platforms that could hold up to choreography on top of them. Made a little money in the process. Building things for this production is someone else's responsibility- we're just painting stuff. For example, when I arrived in the early afternoon I was shown to the above piece of burlap, tacked down over plastic on the empty stage. The goal- half a scary forest. The first task was to lay out a grid of 3.5 foot squares with chalk. 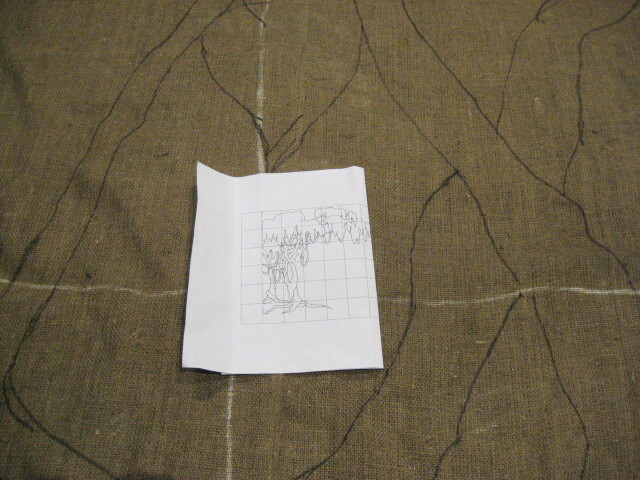 (burlap really wears down a stick of chalk) This worked out to 16 such squares over the large L shaped piece. After that, Pat and I used big Sharpie markers to rough in a complex drawing of a group of trees, based on a gridded sketch on paper. Pat mostly draw the canopy of leaves and spanish moss type growth, while most of my efforts went toward twisted tree trunks, branches, and vines. Reminded me a lot of reading Swamp Thing comics. After that it was time to paint. Ralph took on the section with light green paint (above right), while I mixed a darker green (above center), and Pat worked on the trunks and branches (above left). 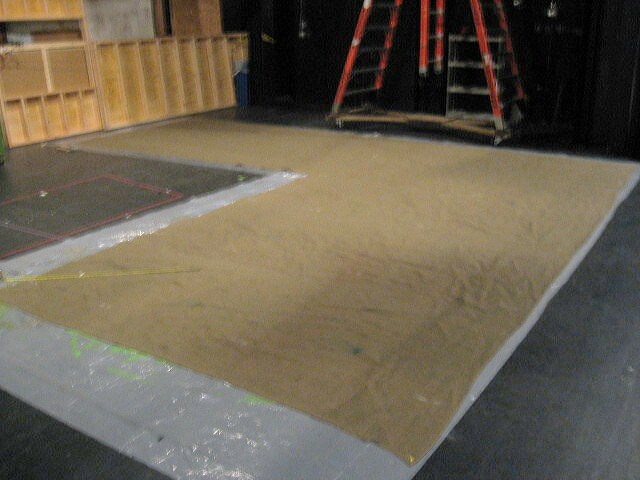 Other than a short break when Pat was almost killed by a falling piece of set construction, the process went smoothly. We called it a day in the late afternoon, a combination of being tired, running out of the colors we mixed, and that we had to leave time for it to dry before the stage would be turned over to rehearsing actors in the evening. This paint is just a first coat, to be covered with a variety of colors and textures in the coming days. Tonight was the opening reception for the 9th Annual Jersey Shore Juried Art Show at the Belmar Arts Council. The muddy fields that we had to cross were a distant memory (finally paved yesterday morning), and hundreds of people showed up to see the 89 artworks. My contribution can be seen above (the story behind it can be seen here) in the back room of the gallery. No prize for me this year, but that's ok, as I'm running out of things to show in the Boatworks. Maybe in a few years I'll have built up enough to be able to do another one. The show remains on display through May 3, 2013. Also in the back room was another piece that may be familiar to readers of this blog. The above painting was chosen by the juror to receive the top award for painting, out of about three dozen paintings in the show. 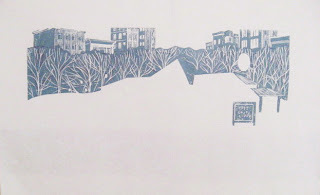 (just one woodcut, by the way) However, back in December, this painting from critique regular Sheilagh Casey was shown in the Studio as part of that month's critique. She had recemtly started experimenting with encaustic [and encaustic style surface effects with acrylics], and the positive response she got to this piece convinced her to keep pursuing this direction. Well, she's got a show in Belmar now early next year, so she better get to work. As for everyone else out there, come to our monthly critique, and see tomorrow's big time art today. Every year in March there are two things I post about that aren't traditional art topics. Yesterday was my annual St Joseph's zeppole posting. 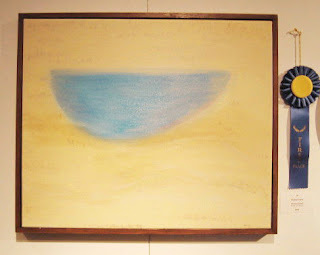 The other is my NCAA Tournament of Art, where I note all the schools that are both in this basketball tournament and that I have artistic links to. Only four this year. In chronological order, they are University of Illinois (exhibition of 366 prints, 1994), Villanova University (exhibition of two prints, 1997), Harvard University (purchase of one print for museum collection, 2000), and Syracuse University (exhibition of 3 prints, 2005). In terms of basketball, Syracuse has the best chance of the four to go far in the tournament, seen as a potential final four team by some. Villanova and Illinois are expected to be competitive, but for a round or two at most. Harvard is not expected to win a game. Not on my list, but of artistic interest to me, is Virginia Commonwealth University, a school known primarily for its art program. It's a 5 seed out of the South region, but a hot pick by many experts to make it to the final four. I'll update the progress of my teams after each weekend, as long as they are still playing. March 19th has come around again, and that means the traditional St Joseph zeppole. I was hoping to grab some this morning to bring to my woodcut class, but I had to deal with a college student crisis and ran short of time. 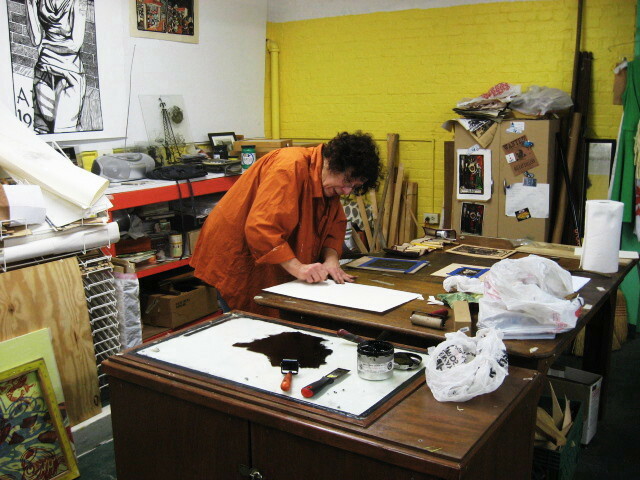 Back in 2004 I brought a boxful on this day up to the SGC conference at Rutgers for my printmaker friends from across the country, only to have them all go somewhere else for the day. Instead I became a hero to all the Wash U. printmaking kids who were still there on campus and unfamiliar with this tradition. My students today know about these treats, but they have the ability to get their own. I had to go down to my parents' house in the afternoon, and I stopped on the way to pick up one at an Italian store that I knew would have some ready. And it turned out that my parents had bought a box themselves and had an extra one for me. Thus the plate above. 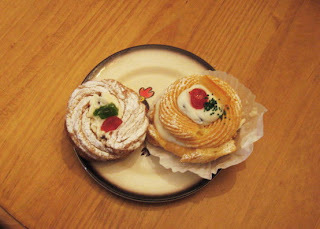 Both are stuffed with cannoli cream (my preferred filling). Naturally, I had to do a comparison taste test. Having tried a piece of both earlier tonight, I can say that both were very tasty. 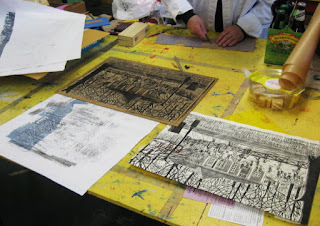 Today was the fourth and last scheduled meeting for this latest round of woodcut classes. Based on the condition of the block all around the Boatworks as of last Friday, and the weather forecasts early this past week, I made the decision to not wait until today to decide to move the class, but worked it out in advance. A ride past the Boatworks on my way up to Ocean Grove confirmed that we made the right decision- still just piles of dirt, a field of very wet mud, plank path, etc. Molly had come in and done a quick clean up of her stuff early this morning, so I merely had to clear my table and bring the stuff in from my car. We were ready to start by 10:00 am. With only two students for the two tables there was plenty of room to work. 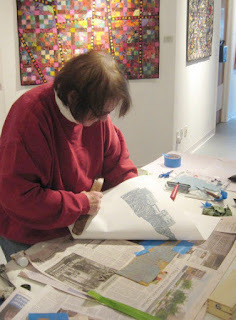 Mary continued with her ongoing two block project. 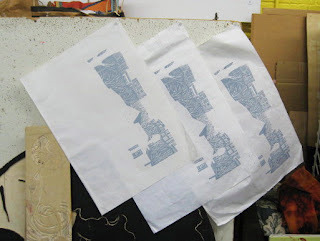 She had cut more from the second background block, and today mixed a slightly lighter shade of the blue gray ink she printed with last time. She pulled three proofs (below) that will eventually be used to test whether her visual idea and registration system will work. 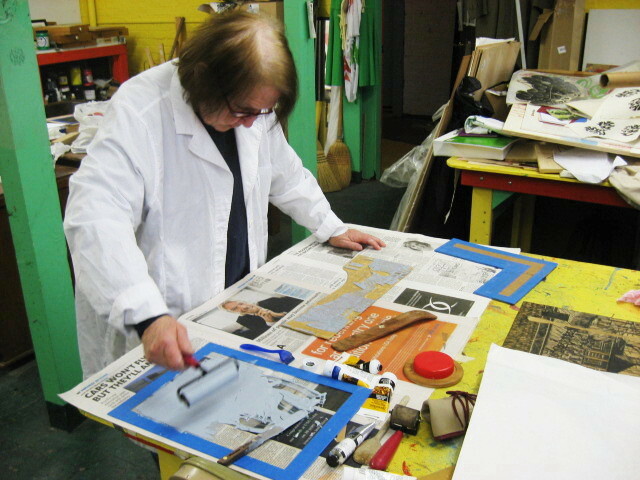 Meanwhile Jill used the time to reprint some previous blocks in preparation for an upcoming show. Above, she's hand rubbing a print (yes we have a press in the room, but I train people in my method, and to be able to print anywhere). 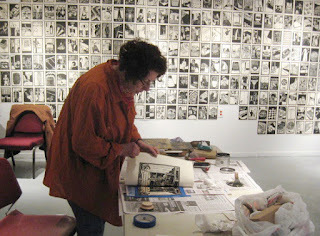 Below, using a bit of mat card to touch up a proof she had just pulled. 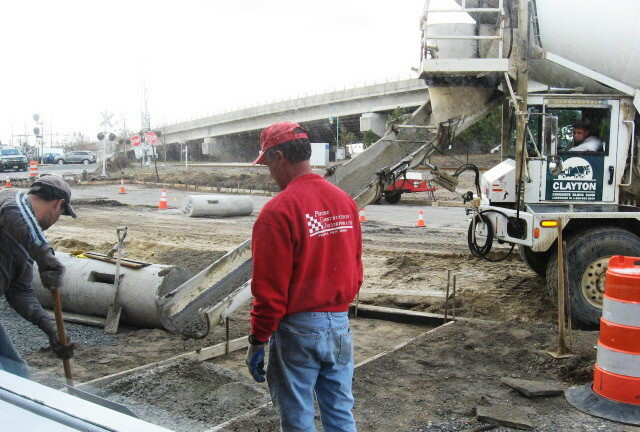 We finished on time and got everything cleaned up. The plan is to set up another round of classes (people have been expressing interest), back at the Boatworks, later in the spring. I'll get the word out when I know the details. This morning I fired up the computer and checked the results of the jurying for this year's big art show in Belmar. I had one piece chosen by the juror, the double portrait above, maintaining my participation streak in this annual show. The story behind this print was posted a few days ago. By rule, only one entry could be chosen, so I was expecting to be at the Boatworks today anyway, but now I knew what I'd have to get. But then I got a phone call asking if I could be a last minute fill in to help with the returning of the rejected works, and I agreed to sit there from 3 to 5 pm today. 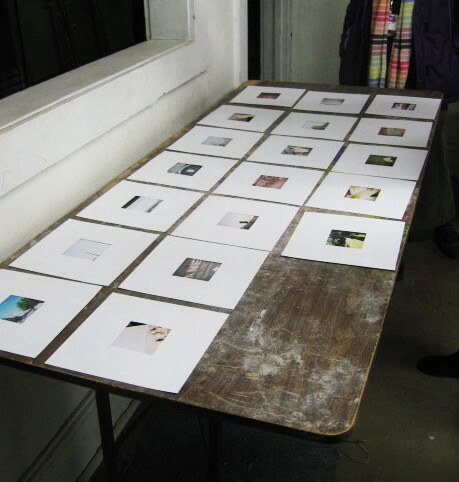 The juror selected 87 works for the show, which left a number a bit larger than that to be picked up. After yesterday I knew what to expect, but the extent of construction was probably a surprise for many of the people who showed up today to claim their work. At least it wasn't raining today. Above you see them pouring the concrete for our new front walk, which will lead from the parking area to our door. 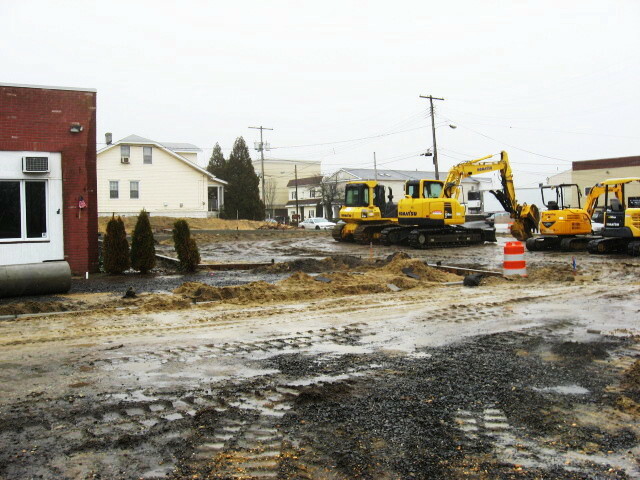 If this is all completed according to plan, it will definitely improve our parking, and we are told the project will be completed by early next week. What this means for my last woodcut class meeting next week remains to be seen. For today, I parked on 7th Avenue, found a path to the door and was there to hand back art to about 10 people. Picked up my bowling print before leaving. 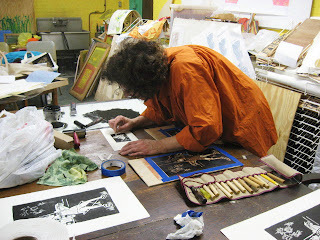 After that, a quick trip to the Studio to take care of a task I wanted to do before next week's last woodcut class, then home to relax and get ready for the rest of my week. It's week 3 of the latest 4 week session of my current Belmar woodcut class. Considering the ever evolving state of our parking area I decided to approach from Main Street and 7th Avenue and get the big picture. So the first thing I saw was all those yellow construction vehicles in our side lot, as well as a bunch of newly constructed curbs. This continued around the front, no way to pull a vehicle into our lot. And thanks to all this construction, no room in the adjacent municipal lot, so after circling around I settled for a street spot on 7th Ave. I walked through the rain around the corner to the front, and then across the mud. As I got close I saw that the only route to the Boatworks would require walking on a wide plank over a ditch, seen just below the window on the left in the photo below. The idea of carrying all the equipment and supplies that way, and my not so young students having to make that journey on the wet, muddy plank, while a big juried show was being hung all around us, led me to make a quick decision to move the class up to the Studio. I sent my students on ahead, let the people in the building know what we were doing, and then drove up to Ocean Grove. The room was still relatively clean from our critique this past Thursday, so it just took a few minutes to clean a few things off the middle table, and the things I keep piled on my table. My two students both had projects in progress and jumped right in. 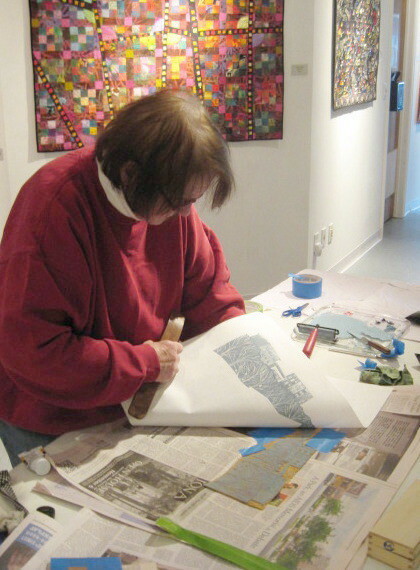 Above, Mary continued work on her multiple block scene, trimming bits from both the black ink key block and the blue background block. She plans to print the new version at home before next week. 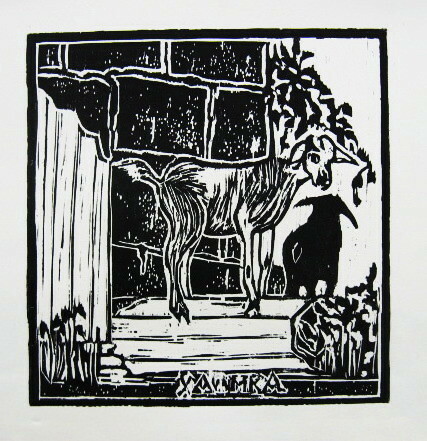 Since last week Jill had made some adjustments to her goats block and pulled a good proof (above) of the new version. Then she pulled a first proof of a new block, the image of a girl feeding birds. She wasn't crazy about the cut block, but after printing it decided it wasn't as bad as she thought. This may become a color piece. The students cleaned up and left, but I still had some work to do. Back in January, Doug Ferrari at SICA had mentioned a possible exhibition opportunity up in Rahway and had me send him some sample images. I chose 4 that represented different styles and subjects of relatively recent work. 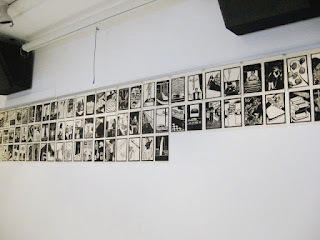 Last week I learned that these images had been added to an online arts registry, and he sent a request for digital photo of a piece for possibly printing in a catalog of this proposed show. I reached him by phone yesterday with some follow up questions, and today I shot a new photo. I have plenty of photos of the above image, but to be suitable for printing, he wants a much larger file than what I typically use for the internet. So I shot it using my camera's largest setting, just barely reaching the 2700 pixel minimum he requested. I took a few, and chose the best one to edit. I'll send it out tomorrow. 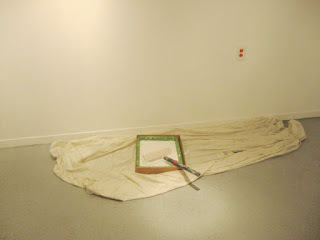 I took all the prints down on Friday afternoon, but I still had one last task to deal with, fixing my wall. Most of the Boatworks repairs were done back in January, but there was one part we couldn't get to then, our extra gallery in the addition. The previous occupants had left behind a 5' high stack of cases of beverages; they said they still wanted it, but were in no hurry to come get it. We didn't need the third room right away, so we dealt with the rest of the building. 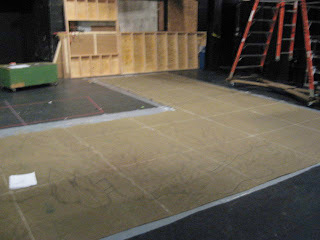 The last of those supplies were finally removed around the time of our JAS8 opening, and in the time since things were cleaned up and the walls repainted. I had Hutch leave the painting supplies where I could get at them. With the new show coming up, the window I had to get this done was today. Got there around noon. Put on my old paint spattered shoes that have served many functions over the years. The biggest challenge was trying to get the 5 gallon pail of paint open. The lid included a screw cap, and the lid itself still had an unbroken seal, so I figured I was to use the cap, but it wouldn't budge. I guessed it was glued shut with dried paint. I scraped at the edge of the cap all the way around, dislodging chunks of dried paint, and soon the cap was free. After that it was pretty easy. I was able to get just about all of it done just standing on the floor, but got up on the ladder to touch of the holes just under the bar that was my top boundary. As requested, I also touched up some other walls, covering assorted smudges and marks that had developed over the past couple of months. I did a very careful clean up, then got on my way. 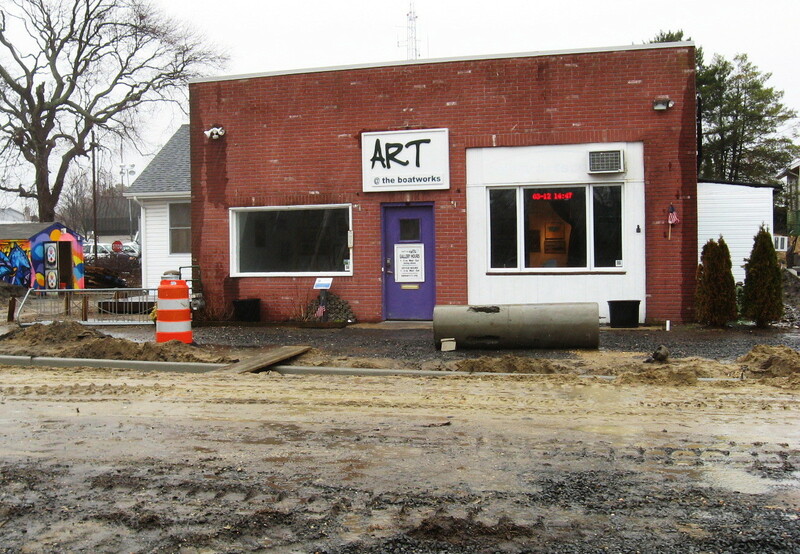 Just about an hour after I finished taking down my show in Belmar, the next show started coming in the door. The intake for this annual juried show is a two day deal, so I opted to wait until today, giving me an extra day to figure out what to submit. One of the rules for the annual juried show is that artists can't submit work that has been previously shown at the Boatworks. Thanks to the exhibition of the Fourth of July, I now figure I've shown well over 400 prints there, and I'm running out of new stuff to exhibit. Following the basement flood caused by Sandy, I removed a bunch of framed older artwork to my apartment, and I started my quest by looking at these. 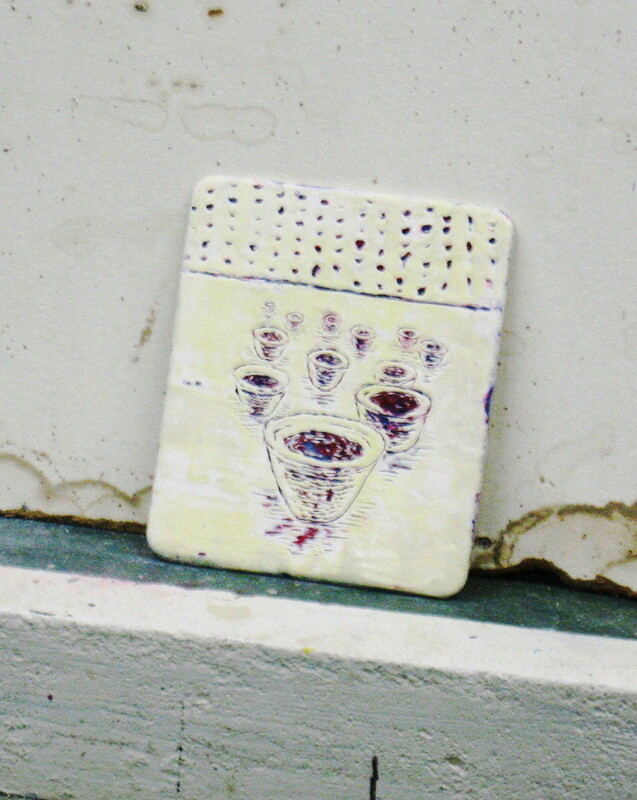 One of the first things I thought about is the piece above, from somewhere around 2000. Back then I had a seasonal job assisting with recreation for people with developmental disabilities, and that meant trips to Atlantic City once or twice a week. Part of my job was pushing wheelchairs through the casino, and sometimes even physically helping our clients to play the slot machines. Wedging myself between the wheelchair and the slot machine, I often saw my own reflection in the chrome surface of the controls. It occurred to me that this might make for an interesting self portrait, if I was the kind of person who liked to gamble. But I'd no interest in playing the machines myself, so I'd just have fun observing and sketching, getting ideas for other projects. As time went on, I thought about it more and realized that I had experience with one big gamble, the decision to pursue a Fine Art major and the life of an artist. 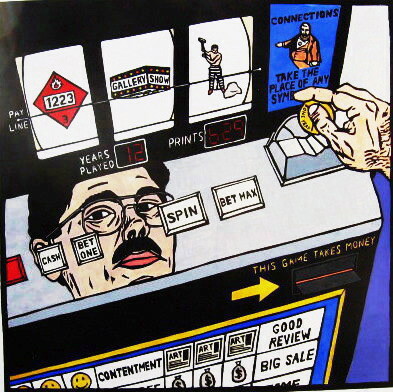 I substituted positive and negative symbols of the art life for the typical images on slot machine dials, and different subjects for the LED counters. 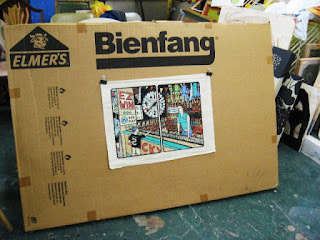 To figure out the exact perspective on a typical slot machine, I took careful measurements of dimensions and angles of actual machines (measuring with business cards and other handy scraps) and built one out of scrap cardboard so I could draw the view from above. I thought the piece, which I called The Art Game, successful, and the first proof even won a purchase award in a 2001 juried show. I framed this second proof, and it appeared in a few solo shows early last decade. It's a good sized piece, framed at 26" square, and decided to save money by using glass instead of plexiglass. (the latter goes up in price as oil goes up in price) When I pulled it out of the pile a few days ago, I noticed that somewhere along the way the glass cracked in one corner, a diagonal break of about 3 inches. Not about to spend money on replacement glass or plexi for a piece that might not even end up in the show, I put it back for another time. It may be for the best. Looking at it carefully for the first time in years, I realized that once again I had unintentionally documented a world that no longer exists. My indicated number of "years played" and "prints" are very out of date, and today's slot machines neither take nor dispense coins and most have computer displays instead of mechanical dials. Regardless of what would be decided about The Art Game, I had decided on the above piece from 2004. 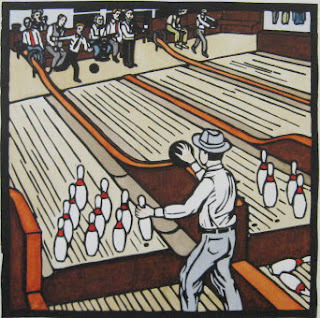 I was invited to participate in a group show with a theme of 10, and came up with the idea of the ten pins in bowling as my subject. The upper part of the image was based on an old family photo I found, perhaps from the 1940's. I invented everything in the bottom half, based on reference I found of old hand set pins. This also allowed me to put the ten pins in the foreground. 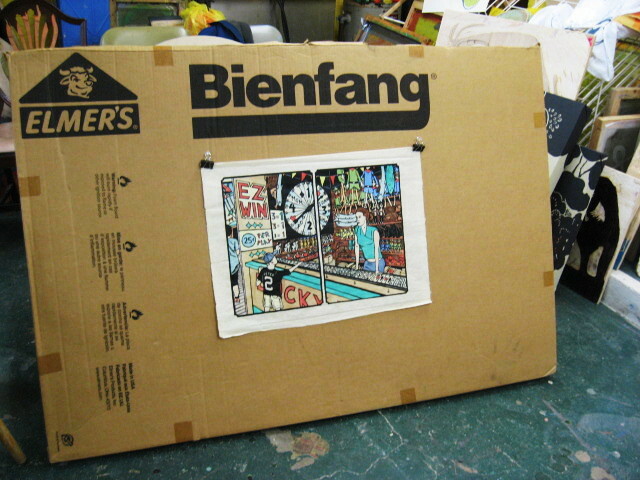 This print, called Tenpins the Old Fashioned Way, appeared in a number of shows in subsequent years, but searching my records, I don't believe I showed it at the Boatworks. It was over at Manasquan, having most recently done duty as a prop in the staged house my parents sold last year. Wanting to provide a second option for the juror, I went back to my pile and pulled out the above print from 1999. My first real print after returning from grad school was an odd piece borrowing style aspects from the trance films of Maya Deren, and narrative element from a dream I had years earlier. Needing a model for the multiple versions of the figure in the piece, I enlisted a former co-worker who has some interest in art and was willing to indulge my odd ideas. The print was a success, and for me an indicator that I could successfully make art without the pressure of grad school to push me along. A few years later she helped me with another odd dream based idea I had. In 1999 the Trance print was accepted into a group show at the Newark Museum and I invited my model to come see herself in that setting. She looked a bit different from her printed image, as she was well along in her first pregnancy. She used the opportunity to suggest a new project- she wanted a formal portrait of herself in this condition, an idea she got from some cable show. I figured I owed her from the two projects she had helped me with, and it could be interesting, so made vague plans to do it in the late fall when she was nearing full size. Looking for an interesting concept, I called her a few weeks before the planned session to ask her was she was thinking about with this pregnancy. She said that she had been adopted (if I ever knew this I had forgotten it) and she had never met her birth parents. So she figured this child would be her first opportunity to see the face of someone she was related to. I could work with that. For the set up I had her looking at herself in a large mirror, touching her enlarged belly and looking at her own face, a double portrait. 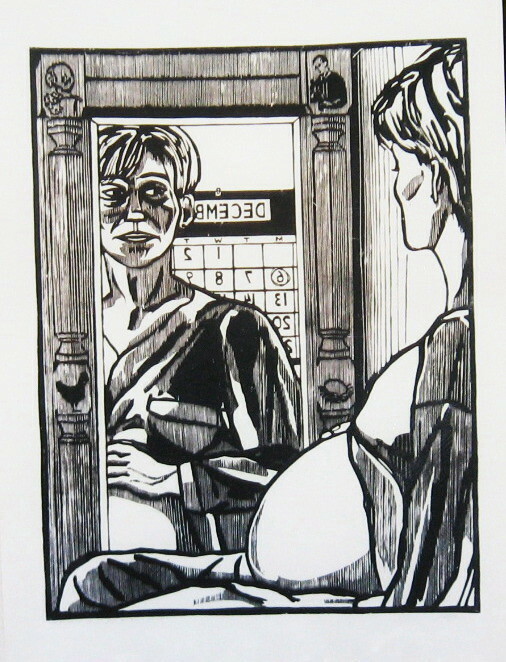 I added a calendar with the due date in the background, and the images on the mirror were various symbols. For a title I directly quoted a Zen koan: "What did your face look like before your parents were born?" Such riddles are meant to inspire meditation, not to answered logically, but I had one such answer here. It would look like your grandparents. In her unborn baby's face, she might be able to see her parents. I dropped off the two pieces at the Boatworks just before the deadline, two of about 200 submissions. From this point on it's in the hands of the juror. I'll know the results of the decision on Wednesday. This morning I looked out my window, and the snow had finally arrived. Just a couple of inches on top of grass and cars, not sticking to roads and sidewalks. And temperatures were rising. So even though the air was thick with snow past noon, there was never any doubt that I'd be able to get up to the Boatworks to take down my show. Just three weeks, a short run, but that's still 3 times longer than its time on the wall during my MFA show in Carbondale. I'm told the whole show got a very positive reaction and a lot of people were talking about it. I'd think it was a good advertisement for the upcoming big juried show. By the time I departed for Belmar the snow had long since stopped. 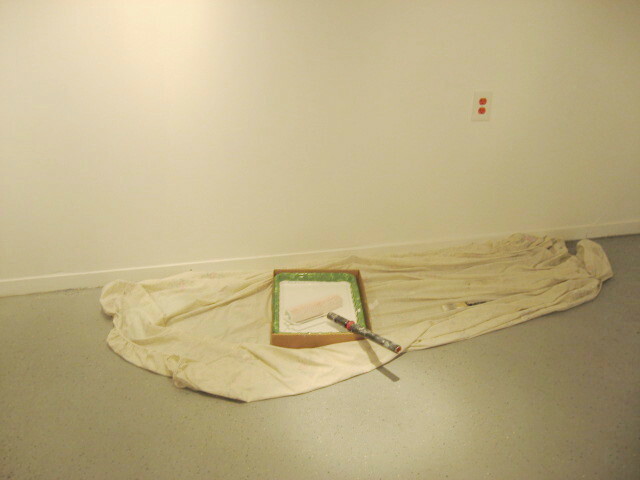 Two of the artists had already removed their works by the time I got there, and a third got his while I was there. The first thing I did was take some large file size photos of my piece while it was still on the wall. I took it down in reverse order from the way it went up, counting backwards from July 4, 1994 and working my way back toward 1993. Not surprisingly, it was a lot faster than putting it up. Working carefully but efficiently, I got it down and packed in just a little over an hour. There is still the matter of some 370 pushpin holes in the wall, but they are small, and we figure a single coat of paint should be enough to cover those. I'll go in over the weekend after the intake for the new show is complete. We're a week into March, and by the standard of some recent winters, this one hasn't been too bad around here. Lots of threats of bad weather, but only a few times did we have any accumulations, and never on a day when I had to do something. The weather forecasters have only a few more weeks of official winter left to scare us and for the past few days we've been told about a huge storm bearing down on our area. Winds, snow, floods second only to Sandy. Well, this has been no Sandy, not that I'm complaining. Predicted snow didn't arrive on Wednesday, or early Thursday. And even though they told is it was bound to show up by tonight, as the time approached we just had a some intermittent rain, and the temperatures stayed above freezing, so we gathered in Ocean Grove for the March critique. 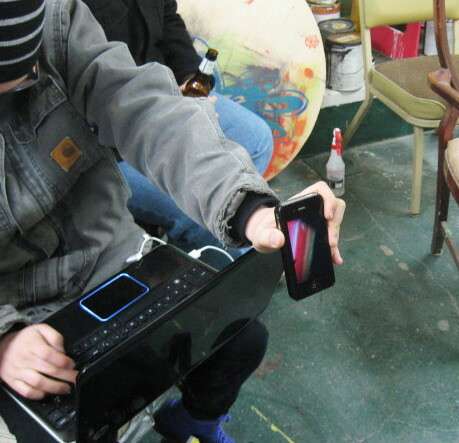 We opened with a digital presentation (above) from TJ, who was unable to get his connection to work, so we viewed some of his pieces on his phone. Some video, and some aps. Our first round on the tack wall (above) included some work from Mary- the first proof from her latest print (a linocut she showed us as a block last time), and the two color version that was started in my class a few days ago. She's not satisfied with the results, but is learning from the mistakes and can probably still salvage the piece. Underneath those, a block drawing in progress. 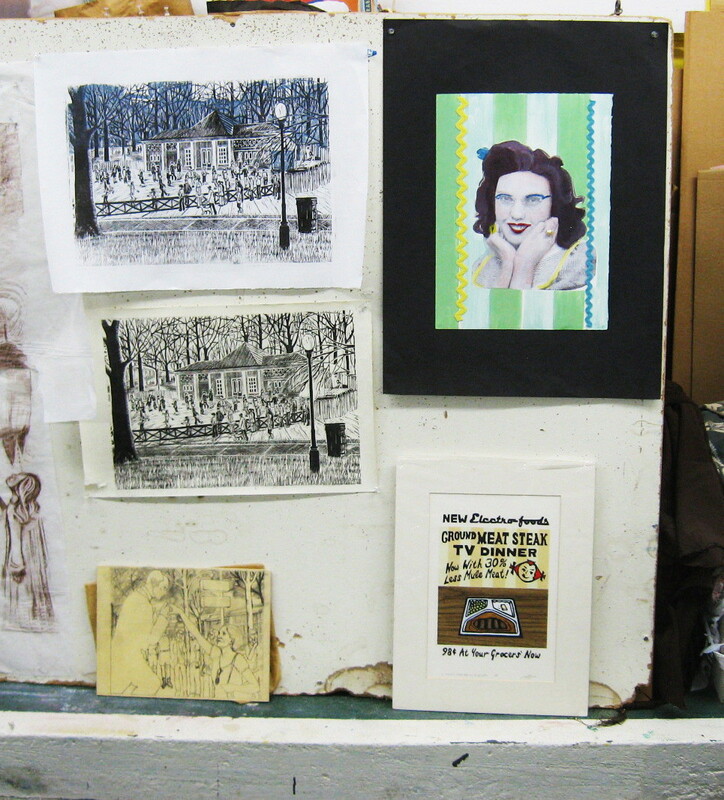 On the right side, two mixed media prints involving stripes- Kristina's piece includes monotype over a photograph, while the older piece I brought in combined woodcut with preprinted papers. I explained why I was influenced to bring in an 8 year old piece, and the group enjoyed that story, as well as the aesthetics of the print itself. Molly had two groups of work out when I arrived. 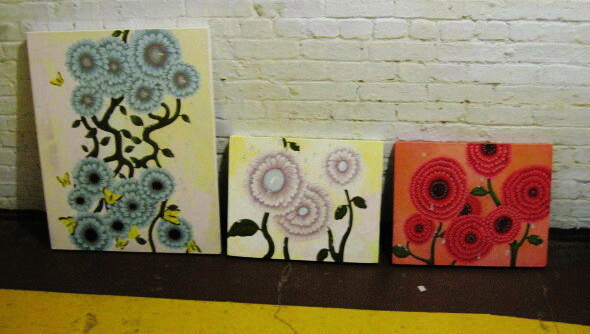 Above are some of the canvas pieces she worked on over the fall, a commission. Below are two new blocks, different sized versions of the same doodle based idea. We spent all her allotted time talking about the blocks. Sheilagh has been experimenting with encaustic over the past several months. The above piece is the most recent such piece she's shown us. The result is a painting with a very strong sculptural presence. As sometimes happens, we had to expand our into the building to show everything. Katie set up her work (above) in the hallway, a trio of paintings on canvas featuring flowers, Finally, Vince had set up in the cafeteria, more images from his long photo based project. We had a rare occasion of finishing on time, and when we made it out to the parking lot. still no sign of any snow. Turned out to be a good night. 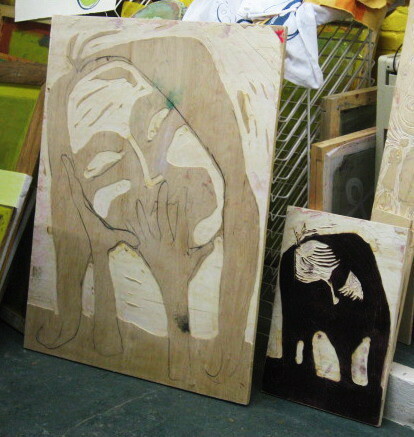 We had week 2 of the current round of woodcut class at the Boatworks. These first two weeks have come with a special benefit, the whole Fourth of July up on the wall in the room where it's held. A few times I have used individual prints to demonstrate approaches to composition and ways to simulate different kinds of objects. One of today's students referred to it as being like having a printmaking textbook on the wall of the classroom. There was a whole lot of printmaking I had yet to learn when I made the piece, but it shows all the things I learned in doing 366 prints., which is well over 300 more than my current students have done. The prints will be down before the 3rd class meeting, so they'll have to be satisfied with my bound photocopy version. As often happens, my students came in with new already cut blocks which I hadn't seen before, ready to print. Above, Jill is pulling the first proof of a new woodcut. She made a few minor cuts to the unprinted block at my suggestion, then printed it. My photo of the print did not turn out well, but she's planning to do a little more cutting and maybe I'll get a good photo of the improved version. She also printed an older block done during our break between classes. Mary has been working on a very detailed image based on a photo of a Boston location, a linocut. The block looked really good when when proofed it last week, but she wants to add a layer of architecture that will be seen past the large foreground building and behind the overhead trees. She decided that she wanted to try to create this with a second block. So since last week she cut a shaped piece of linoleum, and today printed (above) a couple of proofs of this block with a custom mixed blue gray color. Below is one of the printed pieces. By next week she will be ready to ry to prit the black over the blue. I got a piece of mail from the state arts council this afternoon. I had realized not too long ago that we were coming up on about the time when I'd expect to hear the results of this year's Fellowships for Individual Artists, and they hadn't managed to cancel the program this time around. (happened three other years I applied) In the past they sent e-mails when we were approaching decision time, and even extend an invitation to come to the meeting when they voted on the final awards. No such word this time, which is odd considering that I get 2 or 3 e-mails a week from them promoting something. The letter announced the results of this latest round of awards and I didn't get one. The odds are tough (this year 346 applications for what turned out to be 22 grants) so it's not that surprising. I will send away for the panel's written comments, but meanwhile I went to the website to find the list of winners. It turns out I have connections to 3 of the 22 artists. 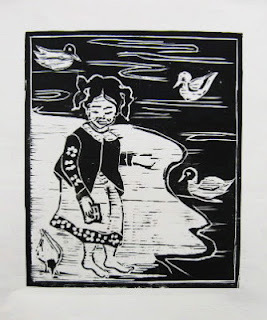 One of the winners for painting is Elise Dodeles, who took a woodcut class I taught at the Printmaking Council back in 2009. The other two were in my works on paper category. I know Marsha Goldberg from being a fellow adjunct professor at my university, though I don't think she has a class this semester. However a few years ago we shared a tall locker in the big painting and drawing room we both used that semester; she teaching the former, and me teaching the latter. 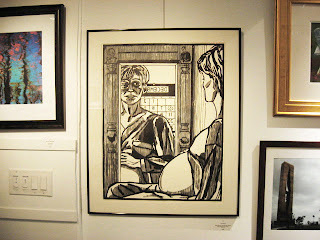 The third winner I have a connection with is Eileen Foti, who I've known going back to not long after I returned from Illinois, when she juried me into the annual members show at the Print Council and awarded me the top prize. Several years later she put me into another show at the Hunterdon Museum, but no prize then. More recently she invited me to be part of an international print show in Estonia, and I've run into her from time to time in between. If I remember correctly, the current set up for the program has each category now come up every three years. So if I can remember to look up the information at the right time, and the program still exists, I will apply again and be hoping for money in 2016. Live enough years, have a long enough memory, and everything comes back again. Qoheleth once said that there is nothing new under the sun, and I have a history of agreeing with a lot of what he said. There are modern ad campaigns and slogans that are identical to some I've found in 50 year old Life magazines. Back in 2005 I produced the above mixed media print for a group folio called Blatantly Kitsch. It had roots in those same Life magazines, but also in found artifacts- old dog food labels of that same era found in the basement. 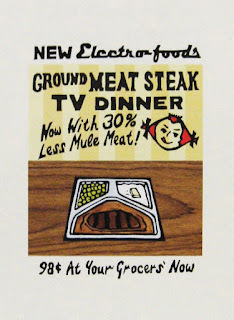 I always knew that horse meat was commonly used in dog food back then, but from the labels I learned that mule meat and mule meat by-products were also major ingredients- at least in this particular brand. You won't find those is contemporary dog foods. 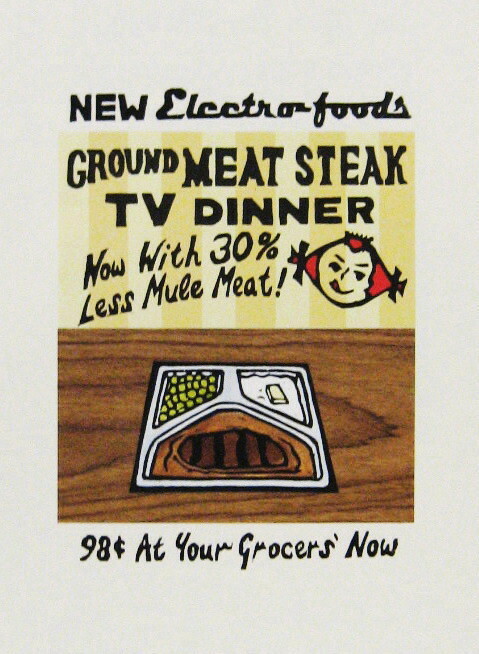 My satirical advertisement above plays with the idea that equine content in our meals would be considered undesirable by most consumers in the early 21st century. You won't find horse meat in modern dog foods, but people are discovering that it is turning up in a lot of human food. News reports began a month or so ago, traces of horse turning up in European fast food burgers. Quick investigations found it in a variety of prepackaged meals sold in stores and distributed in schools in Europe. (so far nothing reported here yet) Another news story today, this time horse in fast food taco meat. That people may be eating horse is not a crime in itself (it's considered a delicacy in some European countries), it's that products being sold as beef are not pure, and who knows what other mystery ingredients might be in there. I don't think it's happened yet, but before long I'm thinking that food producers will start advertising how much horse (or mule) they don't have. You heard it here first.